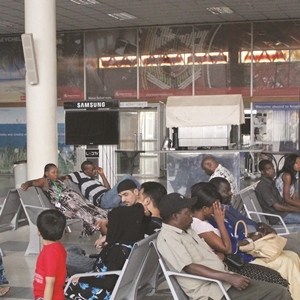 THERE was confusion at the Kenneth Kaunda International Airport on Saturday when Kenya Airways delayed landing for over seven hours and the National Airports switched off electricity for two hours to conduct maintenance works. A check by the Sunday Mail crew found a number of passengers waiting with no information as to when the plane would land. “We are confused.we cannot tell when the aeroplane will land. This is 17:30 hours and the plane was supposed to land at 11:45 hours. Electricity is gone and we cannot get any information on either arrivals or departures,” a passenger travelling to Nairobi said. The passenger who did not want to be named said Kenya Airways are not even giving a concrete answer to what will happen to his connection as he is travelling to China and where they would spend a night in Nairobi. Efforts to get a comment from Kenya Airways officials proved futile as they were all running around trying to keep irate passengers calm. And National Airports Managing Director Robinson Musitala said the power outage was not to blame for the plane’s delay. “The maintenance work we were conducting had nothing to do with the delay or passengers on Kenya Airways being stranded. National Airports was replacing the medium voltage power which had a fault and affected the supply of electricity to the main terminal,” he said. Mr Musitala said National Airports have replaced the power voltage and power to the terminal building is back. He explained that maintenance work is conducted during “dry” periods when there are no planes landing and even if one plane had to land there is always a provision of manual operation which does not cause any delay. By press time the Kenya Airways flight had not arrived.